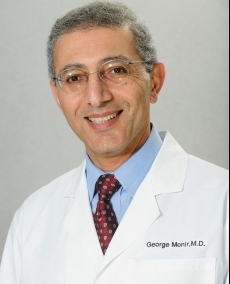 George Monir, MD, is an award-winning, board-certified cardiologist specializing in cardiovascular disease, nuclear cardiology, arrhythmia treatment, catheter ablations and cardiac electrophysiology. He received his medical degree from Alexandria University in Egypt and completed his residency in internal medicine at St. Frances Hospital-Evanston in Chicago. Dr. Monir is the Medical Director of the Arrhythmia and Ablation Center at AdventHealth and has received several awards and recognition for his medical research. He is also a past recipient of the Illinois Society of Internal Medicine's Norris Brookens Award for his dedication to the field of cardiac medicine.